In July of 2003, six Iraqi physicians traveled from Baghdad to USC to begin a six month advanced medical training program. It was the first time in over twenty years that doctors in Iraq could freely participate in a program of international medical exchange. Funded by USC Trustee, Major General William Lyon, and administered by Dr. Randolph Sherman, Chief of the Division of Plastic and Reconstructive Surgery at the Keck School of Medicine of USC, the doctors learned cutting-edge techniques in microsurgery and burn treatment: two areas for which specialized medical knowledge is absolutely critical due to the types of injuries being sustained by the population in this conflict. The doctors' visit to USC was extensively documented, as was their travel to Washington, D.C. where they met with President Bush and Senator Bill Frist. There are also many hours of video footage from inside Iraq. This footage of Baghdad hospitals, health clinics in the countryside, sewage and water treatment facilities and hundreds of photographs of the civilian population created a trove of media documenting the medical crisis facing Iraq and the efforts of a handful of doctors working to combat it. Although their goal was to help their people, ultimately the doctors fled Iraq, some finding themselves targets of assassins. 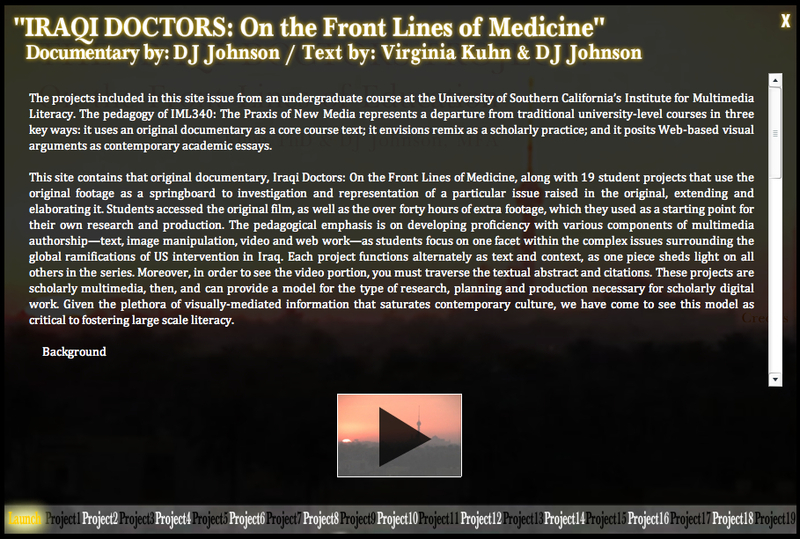 DJ Johnson created the Iraqi Doctors film out of this media, though he did not shoot all the footage himself. But employing a linear approach to investigate an issue that is so multi-dimensional and complex seemed at best inadequate and, at worst, reductionist. A multimedia-based approach to explore, analyze and arrange this media seemed far more appropriate. Digital media offers an opportunity to investigate the war in Iraq and the medical crisis it has engendered on multiple levels, simultaneously. It offers the author and the audience the latitude to uncover shifting perspectives and "truths" as medical, political, cultural, religious, national and individual voices collide and morph over time. The film became a critical point of departure for the students' research into a chosen aspect of the issues raised by US intervention in Iraq. At the end of Iraqi Doctors, one of the physicians notes that life in Iraq will improve, "Maybe not now, but in five years." It was five years later when we began this project and chronological gaps existed between where the film left off and the then-current state of affairs. Students filled some of those gaps by creating scholarly digital projects that broke from the linearity of the documentary film, while also building upon it. Moreover, students in this class had a chance to do work that is alive in the world, and this impacted the degree to which they felt engaged. Not only did the doctors featured in the film answer questions posed by the students via email (they have all relocated but we were able to make contact), the projects were also made public in several places from YouTube to the Remix America site, to the Internet Archive to this text. At the end of the academic year, we created a webtext which includes the Iraqi Doctors film, along with the nineteen student projects. This more public nature of digital media renders the work of the university classroom a potential site of intervention in issues of broad public concern, and aligns it with Gregory Ulmer's concept of the "Fifth Estate," a concept that informs my pedagogical approach. 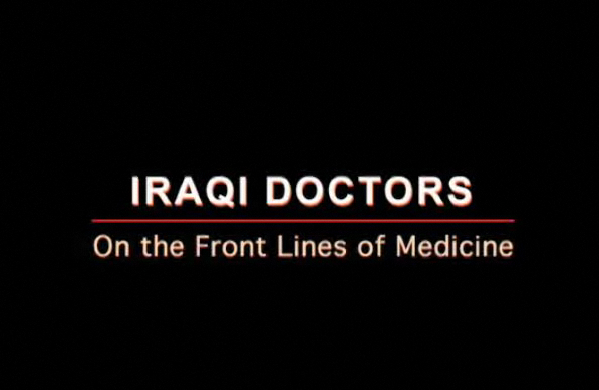 Discussion of "Iraqi Doctors: On the Front Lines of Medicine"
Version 1 id 8062 of this page, updated 21 January 2011 by Virginia Kuhn. Created by Virginia Kuhn.